We’d love your help. Let us know what’s wrong with this preview of Nate the Great by Marjorie Weinman Sharmat. To ask other readers questions about Nate the Great, please sign up. Is it OK to read these out of order? I bought this book for my 8 year old niece; I am not as enamored with this one as I am with the Ivy + Bean books, but it was still a cute book and I think she will love it. And it IS a mystery [gotta start them young LOL] so there is a bonus in that. It was a fun, quick read and I think she will enjoy reading it. Nate the Great is about a boy detective who takes his cases and mysteries really serious even though they are funny and goofy. I think Nate the Great is really funny and very easy for kids to enjoy because it's silly and the art is funny. Older kids will laugh, too. I really like that Nate is always serious when funny things happen. "It was a good breakfast. Pancake, juice, pancakes, milk, and pancakes. I like pancakes." 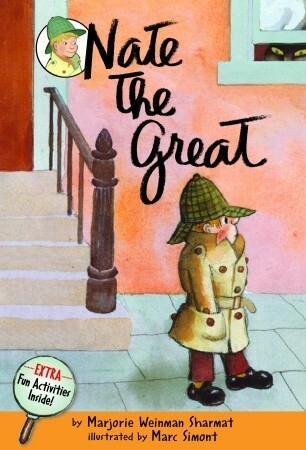 I plan to read the rest of the series but I doubt it will be Nate the Great is about a boy detective who takes his cases and mysteries really serious even though they are funny and goofy. I plan to read the rest of the series but I doubt it will be as funny as the first. This was a favorite of mine growing up! Mysteries are such a great way to get kids hooked into reading. They're propelled to keep going until the mystery has been solved. Highly recommend this beginner's book! Cleanliness: a boy says "I would like Annie if I liked girls." **Like my reviews? I also have hundreds of detailed reports that I offer too. These reports give a complete break-down of everything in the book, so you'll know just how clean it is or isn't. I al This was a favorite of mine growing up! Mysteries are such a great way to get kids hooked into reading. They're propelled to keep going until the mystery has been solved. Highly recommend this beginner's book! Ellie really likes the audio of this book. The audio is actually of several Nate the Great stories. Wolfie loved this one. Should I make his own Goodreads account now that he's reading? But then I have to log in and out... Meh. Great teaching opportunities in this book and the series. I love a mystery. Great way to start children on solving life's mysteries! I loved this book! Ha ha! Humorous and smart. Re-read in 2018. Many lol moments for me. The humor is so dry; I love it! Nate the Great is about a boy detective. He takes his cases as seriously and doesn't let anything get in his way (except for maybe a break to eat pancakes). In this story, he takes on the case of a missing painting for his friend, Annie. The only people to see the painting were her dog, her friend, and her little brother. Annie takes Nate to visit all three and Nate looks for clues. He even solves another mystery in the process. Sometimes the truth can be hidden in plain sight, you just have to Nate the Great is about a boy detective. He takes his cases as seriously and doesn't let anything get in his way (except for maybe a break to eat pancakes). In this story, he takes on the case of a missing painting for his friend, Annie. The only people to see the painting were her dog, her friend, and her little brother. Annie takes Nate to visit all three and Nate looks for clues. He even solves another mystery in the process. Sometimes the truth can be hidden in plain sight, you just have to have pay attention to the details. First sentence: My name is Nate the Great. I am a detective. I work alone. Let me tell you about my last case: I had just eaten breakfast. It was a good breakfast. Pancakes, juice, pancakes, milk, and pancakes. I like pancakes. The telephone rang. Premise/plot: Nate the Great is on the case. Annie, the girl down the street, has hired him to find a lost picture. The picture is in yellow and it is of her dog, Fang. Can Nate find clues and piece together what happened to the picture? My thoughts: I First sentence: My name is Nate the Great. I am a detective. I work alone. Let me tell you about my last case: I had just eaten breakfast. It was a good breakfast. Pancakes, juice, pancakes, milk, and pancakes. I like pancakes. The telephone rang. My thoughts: I loved it! I wish I'd met Nate decades ago. I loved most his narrative voice. "Now show me your room." We went to Annie's room. It was big. It had yellow walls, a yellow bed, a yellow chair, and a yellow desk. I, Nate the Great, was sure of one thing. Annie liked yellow. I also loved the way the clues are revealed. There are plenty of details, but the book also doesn't waste words either. Very cute! We will be reading more of these! This review has been hidden because it contains spoilers. To view it, click here. Favorite part: Nate the Great found Super Hex by stepping on its tail. This is what I read in Nate the great . Nate was eating pancakes for breakfast .Then his freind Annie called and asked him if he could come over. After that Annie told Nate that she lost a picture of her dog. That is when Nate started investigating so he asked Annie where was the last place she had it. Annie hadsaid that the last place she had the picture it was by the window. Then they had went to Nate's other friend Rosamond house and tried to look for the picture but all they found were pictu This is what I read in Nate the great . Nate was eating pancakes for breakfast .Then his freind Annie called and asked him if he could come over. After that Annie told Nate that she lost a picture of her dog. That is when Nate started investigating so he asked Annie where was the last place she had it. Annie hadsaid that the last place she had the picture it was by the window. Then they had went to Nate's other friend Rosamond house and tried to look for the picture but all they found were pictures of cats. The Rosamond asked them if the could find her cat named superhex. After that Nate went t go seat down and that was when he stepped on Super Hex's tail. Nate And Annie had went back to Annie's house where they saw her little brother named Harry. They had saw Harry's paintings on the wall. Then Nate had noticed that the tree, the clown and the house were re but the three-headed monster was orange. Nate had remembered that Annie's painting of her dog was yellow and the monster was orange. He had did the math and Annie's painting of her dog was the Harry's three-headed monster. The main character is Nate the Great . Nate is a caring person and loves to help people . They do not have no dislikes. Just to be nice to everyone. Yes because he is a nice person. Nate the Great by Majorie Weinman Sharmat and illustrated by Marc Simont is a cute tale about our great hero, Nate, who is in fact, a detective. Do not let this lengthy book fool you, it is not for the older readers. The book is meant for young readers with unlimited imagination. The story is simple, but simple enough to keep your attention all the way through. The tone of the book is extremely straightforward, and not as ominous as one might think a mystery book to be. The style includes chop Nate the Great by Majorie Weinman Sharmat and illustrated by Marc Simont is a cute tale about our great hero, Nate, who is in fact, a detective. Do not let this lengthy book fool you, it is not for the older readers. The book is meant for young readers with unlimited imagination. The story is simple, but simple enough to keep your attention all the way through. The tone of the book is extremely straightforward, and not as ominous as one might think a mystery book to be. The style includes choppy bits on information interlaced with clues leading to a crime that our one and only Nate the detective can solve. There is no dark humor or any hidden messages to find. The story line is, simply put, a storyline. The illustrations are extremely minimalistic, which goes hand-in-hand with the way the writer has created the story. Just enough is shown as to not lose the reader but it can help a child to bring the story to life. There is almost nothing but blank space on the pages of this book, and where color is used—it is used very sparsely only where it is needed. All in all this book was a good read if you are looking for something simple to sit down with your creative child to read. My children have always raved about Nate the Great so I decided to grab one of their summer reading books to take a look at what they are talking about. Nate the Great is a private detective who takes on a new case. His friend Annie's picture has gone missing and it is up to Nate to sleuth out what happened to it. This is a beginning readers book and as such it is very simply written for young children. It is a wonderful introduction to the detective mystery. It is enough to keep a child's attent My children have always raved about Nate the Great so I decided to grab one of their summer reading books to take a look at what they are talking about. This is a beginning readers book and as such it is very simply written for young children. It is a wonderful introduction to the detective mystery. It is enough to keep a child's attention and introduce words for this age group. OK this has got to be my favorite yet on this research project. It's an book that's easy to read WITH A STRONG VOICE. Wow. Who knew you could tell a story with so few words, with only EASY words, and still make you laugh out loud. I heard Harry's voice so distinctly that I will most certainly go hunt around for anything and everything else by this author that I can find. I'm just that impressed. Well done and very highly recommended. The writing is lame. But given that, the story itself is actually pretty good. It captures a kid actually being a detective pretty darn well - making breaking down the problem, planning, observing. Probably would work okay as a kid's early read-to-self book. And the art was certainly good enough. But the writing style itself took too much away. Fun chapter book. My kids enjoyed it and I had fun reading it to them. Nate the Great is a fun adventure book about a little boy named Nate who solves mysteries. It is part of a series and this particular book can be read online by looking it up as an ebook. In this particular book, Nate is solving a mystery for his friend Annie and is helping her to find a picture she lost. The book is comical and has a light sense of humor to it, but it also written in the mystery format in which there is something missing/wrong, and the "detective," which is Nate, sets out to fi Nate the Great is a fun adventure book about a little boy named Nate who solves mysteries. It is part of a series and this particular book can be read online by looking it up as an ebook. In this particular book, Nate is solving a mystery for his friend Annie and is helping her to find a picture she lost. The book is comical and has a light sense of humor to it, but it also written in the mystery format in which there is something missing/wrong, and the "detective," which is Nate, sets out to find the lost picture. This story would be more for the upper grades of 3-5, and I think it would be very engaging for these grade levels. This story is a lot of fun, and it is only increasingly funny when listening to Nate narrate the story! Children would enjoy the light suspense and the "twists and turns" the book takes as Nate and Annie look for her picture. In the end, they certainly do find her picture. Her brother had painted over hers! One way this could be used in the classroom would be to have students read this either independently or in some book club kind of setting, and then as a fun extension activity, the teacher could set up some kind of mystery for the students to solve that would involve them looking for clues around the classroom, potentially solving problems to get to the next clue, and ultimately being able to solve the mystery. This would take time and planning, but I think it would be a fun way for the teacher to potentially culminate a study of this book. It could be done in teams or individually. This would really engage the students and help them to better understand the genre of mystery by directly doing something to "solve" a mystery. Another way this could be used in the classroom would be by having students work as a group to write their own mystery with some kind of story map/planning. Students so often come up with add-ons or alternate endings to stories, and I think it would be a fun activity for students to write their own mysteries. They could involve Nate the Great, or they could have a new main character! Students could collaboratively write this new mystery and refine it until they are ready to share with the class. This could even go a step further and be read/narrated as a Reader's Theater activity! I think this is an activity that could be built upon and would really help students to think creatively about the story they've just read. Nate the Great is a children's book written about a young detective on the quest to find her friend Annie's lost picture. In the story itself, Nate the Great, is a very professional detective. He takes his job very seriously, and has a certain code of ethics that he sticks to. Nate is someone who refuses to laugh or even eat on the job, because he knows what it means to be a true detective. Nate's adventures lead him on a trail of different clues and suspects that ultimately leads him to his onl Nate the Great is a children's book written about a young detective on the quest to find her friend Annie's lost picture. In the story itself, Nate the Great, is a very professional detective. He takes his job very seriously, and has a certain code of ethics that he sticks to. Nate is someone who refuses to laugh or even eat on the job, because he knows what it means to be a true detective. Nate's adventures lead him on a trail of different clues and suspects that ultimately leads him to his only suspects. The reason that I gave this book the five stars is simply because it is very relatable, now as an adult. When I was a child I can fondly remember playing different games such as detective that really allowed my imagination run wild, and I believe that this book captures that perfectly. When you are a child playing detective, you are very focused on your job, and do take it very seriously. The main thing that caught my eye with this piece would have to be the simplistic, yet affective, art work done by Marc Simont. His use of pencil drawings and water colors was what I believe to be a highlight of this book. I also loved how the illustrations worked around the text. At times you would have illustrations below the text, other times it would be above the text, and even at times the illustrations would be across both pages! The font used throughout the book seems to be a rather simple style, but I believe it works well regardless, when it is worked around the pictures in the story. Overall, I thought this book was very well done by both the author, and the illustrator. I honestly have nothing negative to say about the book. I would thoroughly recommend this book to anyone looking to read it, or have their children read it as well. Especially a copy that has the interactive activities add on to it as well. "Nate the Great" was a very good book by Marjorie Weinman Sharmat about a young detective and his search to find a missing painting. I really enjoyed this story because of the simple (yet funny) lines and how Nate, even though he was a child, was very thorough in his investigation. This book would be a great read-aloud book because there are so many opportunities in the story for students to make their own predictions. Another aspect of this book that I liked was how the illustrator, Marc Simont "Nate the Great" was a very good book by Marjorie Weinman Sharmat about a young detective and his search to find a missing painting. I really enjoyed this story because of the simple (yet funny) lines and how Nate, even though he was a child, was very thorough in his investigation. This book would be a great read-aloud book because there are so many opportunities in the story for students to make their own predictions. Another aspect of this book that I liked was how the illustrator, Marc Simont, included people of color in his illustrations. This gave the book even more character and made it more realistic. The storyline was also very intriguing and included little fun facts throughout the story; facts such as Nate's love for pancakes. Proof that simple sentences don't necessarily mean boring content. "Nate the Great" is a wonderful introductory book, full of humor and interesting themes, accompanied by evocative illustrations in a bright, juicy, limited color palette. The pictures, to me, are the cherry on top; they're not overly explanatory, so that early readers can "guess" the words based on the pictures, but are illustrative (for lack of a better word) enough that it could help with context. I loved the noir feel of this Proof that simple sentences don't necessarily mean boring content. "Nate the Great" is a wonderful introductory book, full of humor and interesting themes, accompanied by evocative illustrations in a bright, juicy, limited color palette. The pictures, to me, are the cherry on top; they're not overly explanatory, so that early readers can "guess" the words based on the pictures, but are illustrative (for lack of a better word) enough that it could help with context.